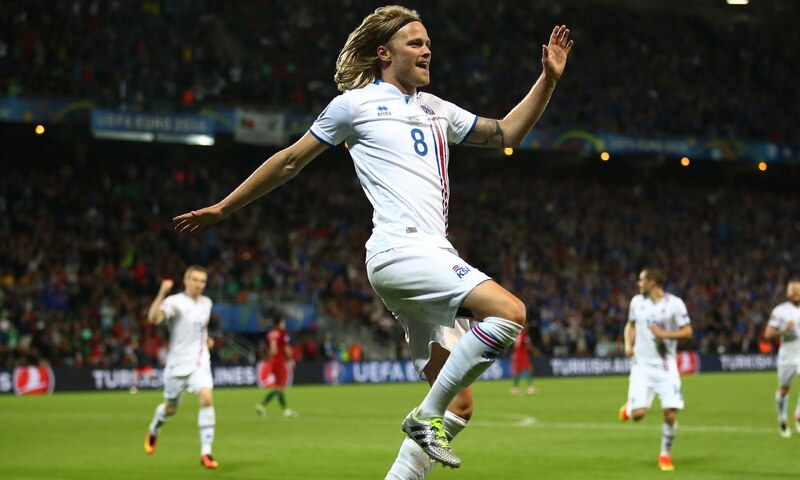 A second half equaliser from Birkir Bjarnason cancelled out Nani's opener and helped Iceland to the unlikeliest of draws against top seeds Portugal. Iceland were making their competitive tournament debut, with the not so simple task of defying Cristiano Ronaldo and his Portugal team their first assignment in Saint-Etienne. With 6% of their nation's inhabitants in attendance at the game, the underdogs belted out Lofsongur, the country's national anthem, and the sense of a David vs Goliath encounter crept in as kick-off approached. Iceland kicked off the game - all guns blazing - with a robust attitude and relentless hard work the order of the day. It took Swansea craftsman Gylfi Sigurdsson just four minutes to show why he is the main man for his country too, picking the ball up on the left flank and weaving his way into the box before unleashing a shot that stung the palms of Rui Patricio. A breathless start continued, as Nani leaped highest to meet a cross, his header underwhelming. It truly was one of the most deafening atmospheres the tournament has seen so far, as a minute lake of blue Icelandic faithful attempted to drown out the field of green and red Portuguese supporters. Ronaldo then sprung to life as he met Pepe's ball over the top, though the Real Madrid man's volley lacked the accuracy and power to make the net bulge. Moments later, Portugal led 1-0. A wonderfully worked move down the right flank by Andre Gomes and Danilo ended with the former putting the ball on a plate for Nani, the Fenerbahce man notching in from close range. Gomes and Moutinho threatened to put the game to bed, with a pair of dipping efforts from distance. 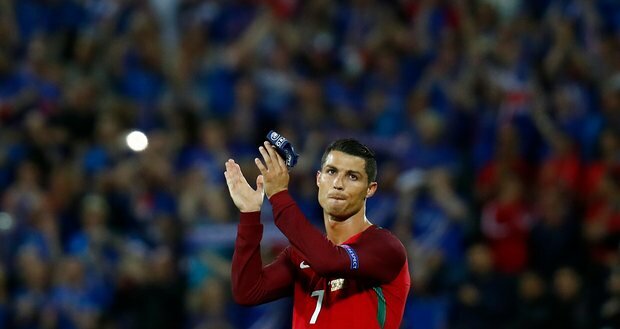 As the game restarted after the break, Ronaldo, making a record equalling 127th appearance for country, drilled a left footed volley slightly wide, a warning sign for Iceland if there ever was one. However, it was the Portuguese defensive line that fell asleep, as Bjarnason peeled away from his marker to volley in unmarked from a dangerous cross. Bedlam ensued inside The Green Cauldron, as Iceland celebrated a historic goal against the favourites to win Group F.
Persistence proved to be the name of the game for Andre Gomes who again tried his luck with a pot-shot at goal, while his header from a corner was batted away by goalkeeper Hannes Halldorsson. The Icelandic fans found their voice once again with a menacing, synchronised chant, hoping to spur on their team to a shocking win. Nani again posed an aerial threat into the dying embers of the contest, his header sailing wide as Portugal continued to flood forward, leaving the door open for Iceland to strike on the counter. Alfred Finbogason - on as a substitute - gave Patricio something to think about in the Portugal net, while Ronaldo failed to make use of a series inviting free-kicks as the game petered out to a close. A shocking result, as Portugal failed to make their mark at the end of the opening week of the tournament. Many had thought Ronaldo would put an end to the goal-barren start, but the men from the Land of Fire and Ice had other plans. Fernando Santos' men will still be expected to qualify though, and as we saw with Hungary's stunning victory over Austria the window of opportunity is there for any of the other three teams to advance from the group.